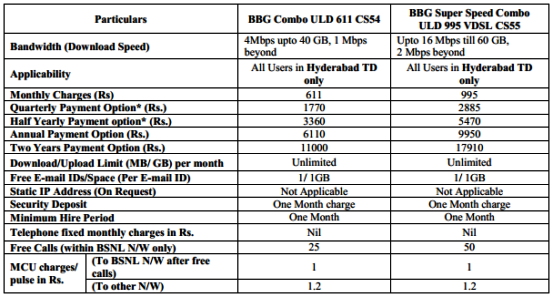 BSNL has announced the launch of a new Unlimited ADSL Broadband plan BBG Combo ULD 611 CS54 and BBG Super Speed Combo ULD 995 VDSL CS55 plan exclusive for Hyderabad telecom district. Both plans offer unlimited broadband with higher post FUP speeds. BBG Combo ULD 611 offer unlimited broadband at 4 Mbps up to 40 GB and 1 Mbps after 40 GB. New VDSL plan BBG Super Speed Combo ULD 995 offers a download speed of 16 Mbps up to 60 GB and 2 Mbps after 60 GB of data usage. Both these plans will be available from 01-03-2015 onwards for customers in Hyderabad Telecom District Only. BBG Combo ULD 611 plan come at a fixed monthly charge of Rs 611 including 25 free calls to BSNL network with rent free landline. The VDSL plan costs just Rs 995 along with 50 free calls on BSNL network with rent free landline. Annual and two year payment offer available on both plans. 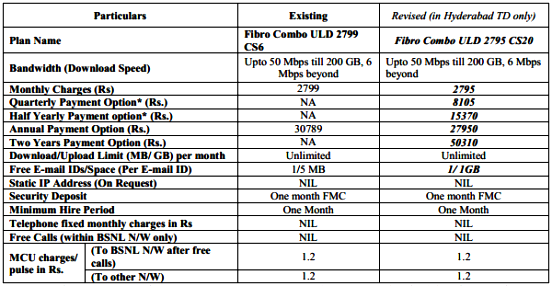 BSNL has also revised it's existing Fiber Broadband Plan - Fibro Combo ULD 2799 CS6. The revised plan Fibro Combo ULD 2795 CS20 offers a download speed of 50 Mbps up to 200 GB and 6 Mbps beyond 200 GB with a monthly rental of Rs 2795. BSNL also introduced annual and two-year payment offer for Fibro Combo ULD 2795 plan. These plans offers 1GB of e-mail storage instead of 5MB. New plans are really exciting and offers true value for money compared to existing plans from any other Broadband service providers in the market. The only problem is, these offers are now limited to Hyderbad Telecom District Only. BSNL decided to launch these exclusive offers to compete with private broadband providers like Beam Tele. Hope these offers will be extended to other telecom circles also. Dear readers, please share your views about these escellent Broadband offers from BSNL via comments.